For a few weeks, I have been chatting about the collaborative efforts between Cohesity and Pure Storage mutual commitment to develop an innovative joint solution designed to deliver the best end-to-end storage transformation results for enterprise data centers from an overall technology, performance, operations, and cost efficient standpoint. Today is the day, Cohesity and Pure Storage together delivers a unique solution that focuses on the strengths of each other’s primary and secondary storage functions and capabilities to enhance the overall value and capabilities of the primary storage solution. As a primary storage solution, Pure Storage has been leading the transition to all-flash storage arrays for mission critical applications. Pure Storage’s FlashArray//M are typically used to run I/O intensive physical and virtualized business critical applications such as databases environments. 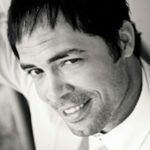 These systems are very fast and capable of delivering and maintaining strict performance SLAs. 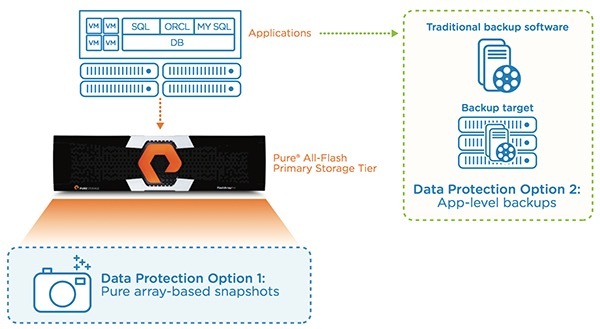 For data protection and availability, Pure Storage provides a customer the ability to use array-based snapshots to provide non-disruptive data protection for all applications stored on the storage array. Now, when comparing this approach to the traditional, and antiquated backup solutions, Pure Storage array-based snapshot deliver better efficiency and faster results. Each available option introduces their pro’s and con’s, and ultimately organizations choose the option that complies best with the business requirements and SLAs whether it be from Capex or OPEX perspective or the balance of both. The reality is that the best option is to use array-based snapshots for data protection, but the big problem with this option is that the snapshots are going to be stored on the same storage array where the applications are hosted. This results in the reduction of flash storage capacity, performance, and even more important here is the risk of data loss in the event of an array failure. As a secondary storage solution, Cohesity DataPlatform – a best-in-class space efficiency platform, that is specifically designed to consolidate and manage data protection functions and other secondary storage functions such as test/dev copies, files, analytics data, and objects. By natively integrating with Pure Storage, Cohesity significantly improves the value, capabilities, and reduce potential data loss risks from primary storage arrays such as Pure Storage’s FlashArray//M. 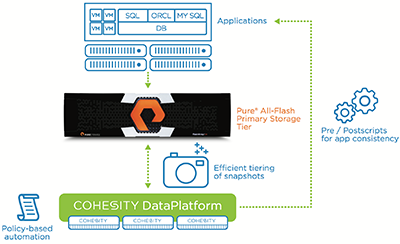 Cohesity integrates natively with Pure Storage FlashArray//M to improve snapshot-based data protection. 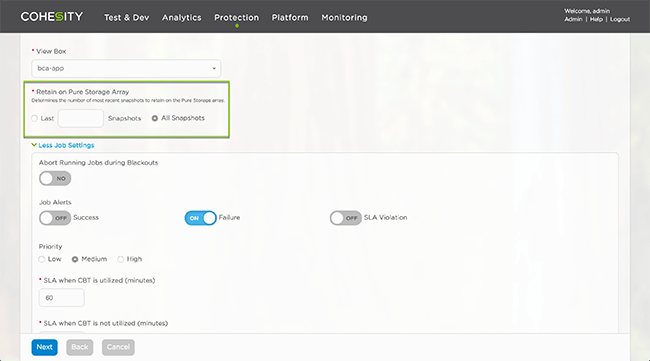 The integration enables customers to dynamically tier snapshots between Pure Storage primary storage and Cohesity secondary storage to provide the best possible data protection. Customers can keep their most recent snaps on Pure Storage for faster data protection, but move long-term snapshots dynamically to Cohesity secondary storage. This integration demonstrates how as a secondary storage platform, Cohesity complements primary storage solutions by improving data protection with two layers of storage, reducing data protection costs, providing snapshot management, capabilities, and more. Look at the demonstration below and get a quick peak at the Cohesity and Pure Storage Integration in action. Cohesity is NOT Just Another Backup Software (J.A.B.S), we are much more…, Get ready because there is much more to come.